This book is part of the Urban Sketching Handbook series. I have the previous two books as well on Architecture and Landscape, and People and Motion both authored by Gabriel Campanario. Veronica Lawlor is the author of this book and she's know for her lively and reportage sketches. 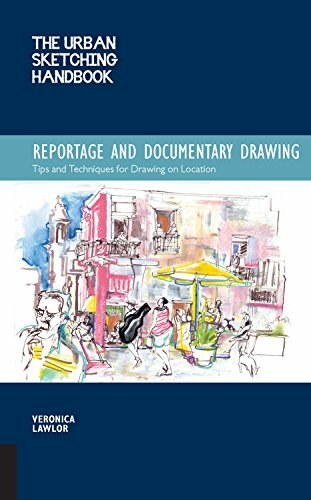 This handbooks features the many techniques that Veronica uses for her reportage sketches. The key points are on observation, storytelling, drama, ritual, history and documentary. The idea is to incorporate all those techniques and subject matter into your sketch. That way, you'll be able to bring across the story that's hidden in the drawings. It is often that story that will give the drawing its depth and prompt people to wonder what's happening in the scene. To get the most out of the book, you should at least know how to sketch. The book is rather brief, I find that the tips are very useful and good starting point when it comes to creating your own series of themed sketches. The instructions are concise and there are lots of examples from other fellow sketches, such as from Melanie Reim, Cathy Gatland, Greg Betza, Ted Michalowski, Don Low, Evan Turk and more. The book concludes with several galleries with the themes advocacy, portraits, landscapes and panoramics, mood and emotion. The example sketches all build on what were taught earlier. Overall, it's a very practical book with lots of hands on tips that you can use straightaway. I would recommend this to sketchers who want to add more depth, story and context to their work.